As a well-known appreciator of Final Fantasy V, to the point where I wrote a whole book about it, I love that Japan feels the same way to the point that there’s actually a market for this very specific merch based on this 1992 Super Famicom game. 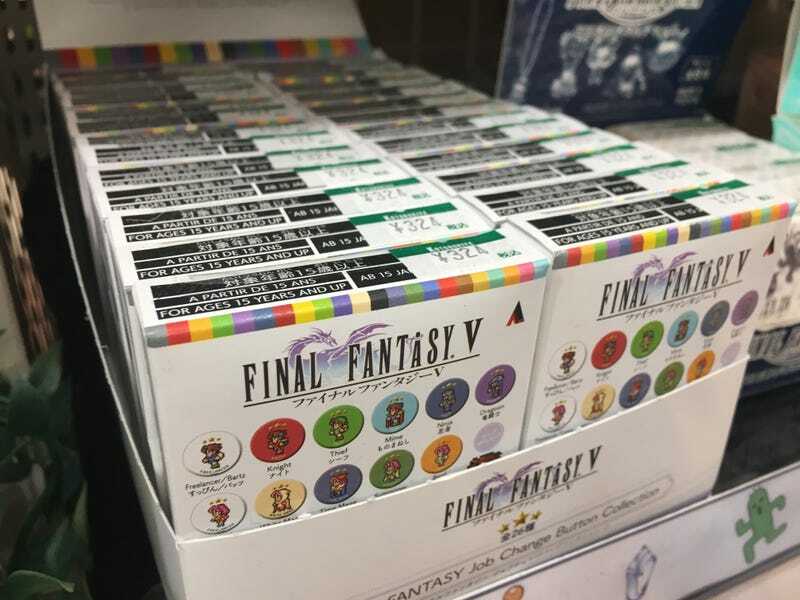 In the grand Japanese tradition of “blind boxes,” we have this “Final Fantasy Job Change Button Collection,” in which you pay about three dollars each for small two-inch metal buttons featuring the characters of Final Fantasy V dressed up as the game’s entire selection of job classes. There are 26 different buttons to collect—each of the game’s five playable characters in their “freelancer” costumes, and then buttons for each of the game’s 21 selectable jobs. Check that out! It’s a perfectly viable Final Fantasy V grouping, with Butz, Lenna, Krile, and Faris. I stopped right there, as this was clearly a message from the gods telling me I had my party. Now, this is pretty cool on its own, but there’s one final piece of the puzzle that truly makes this amazing. That’s right: You can buy a canvas tote bag featuring the iconic Battle On The Big Bridge scene, with a giant Gilgamesh pin that you can set your party against. And that’s why this is the ultimate FFV swag. Yes, I know Krile wasn’t on the Big Bridge. It’s my party and I’ll bend time if I want to.